Ships and troops of Black Sea Fleet (BSF) prepare for combat training within all-arms task force of Southern Military District. "Black Sea Fleet is a component of inter-branch force established at the southwestern theater. 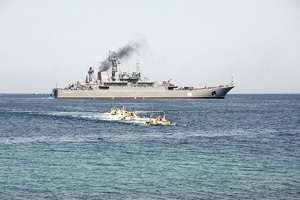 The fleet's basic objective is to protect interests of the Russian Federation within responsibility area including the Black and Mediterranean seas", said BSF Deputy Commander Rear Admiral Alexander Troyan answering the question about the fleet's mission. He did not give any details specifying that statement, only added that "basically, the fleet is quite combat-worthy and capable to accomplish every assigned task at any region throughout the globe. Our servicemen are qualified enough to do that effectively". The admiral noticed no contradictions between the "basic objective" and "capability to accomplish tasks at any region". Neither said he who exactly had given such high estimate to the fleet's combat worthiness. We were supposed to find it out by ourselves at 13th Range in Kazachya Bay, Sevastopol where marines of 810th Marine Brigade were training, and at sea firing drill of air-cushion missile ship Samum (hull number 616, Project 1239 Sivuch). What an incredible view – against the cloudless azure sky and intense turquoise water, large landing ship Caesar Kunikov turned on the wave, opened bow ramp and like fabulous whangdoodle whale let out army-green amphibious personnel carriers (BTRs). Like floats they surfaced the sea and headed for the coast slightly swinging, cutting foamy waves and peppering the "enemy" with heavy machineguns. BTRs lined up on the go and distributed targets and assault objectives. Not reducing fire intensity, they came ashore and divided into attack directions. Marines jumped down and sheltering themselves behind vehicles continued to pepper the "enemy" by rifles and machineguns. In couple of minutes the area located between a city beach and Ukrainian oil depot was seized. Marine units consolidated on objectives and were waiting for the second assault wave. Sure, in real combat conditions enemy would unlikely let marines come ashore in such easy way. Perhaps, it would apply missiles or attack aircrafts against the landing ship, and if she managed to let out APCs, they could be easily shot down by artillery guns or aviation. However, landing operation would not be carried out at random either, only after thorough reconnaissance and suppression by missiles, aviation, and concentrated fire of artillery. Personnel carries afloat would be covered by assault aircrafts, helicopters, and all kinds of guided missile ships… And it would be seen who could win the battle. Everyone in marine brigade clearly understands the window-dressing of conducted tactical drill. Deputy brigade commander, Hero of Russia Lt. Col. Vladimir Karpushenko says the assault company headed by Snr. Lt. Alexander Aleshnikov was tasked to practice control of 100 marines and 10 armored personnel carriers while afloat and learn how to meet time norms of APC embarkation (this must be done in several minutes), debarkation afloat (also performed in shortest period), and organized coming ashore. All those things are accompanied with combat fire imitation and absolute observance of safety precautions. Hero of Russia Col Vladimir Belyavsky, 810th Marine Brigade Commander told us he was satisfied with the fact that the exercise had been held without breakdowns and violations of safety rules. "Sure, there are some minor remarks on some special issues, and we're going to hold a summary briefing", said the colonel. "But basically, I'm satisfied with the exercise. There are some matters to work on, i.e. problems of control and interaction with landing ship brigade during APC debarkation afloat, minimal residence time of ships near the shore. The second issue is synchronism of coming ashore, density of the assault unit, and density of fire at enemy's targets". "We also trained all elements typical for infantry – defense, offense, and so", he explained to journalists. "However, there is a critical distinction. To us, landing ashore is the main thing. Thus, we continuously practice teamwork issues, just what you have seen today. Training process moves fr om simple to complicated things – first teamwork within squad, then platoon, and so forth right up to battalion and brigade in general. All those things are practiced". And quite intensively, says Lt. Col. Karpushenko. Marines conduct tactical company drills in cooperation with BSF sailors almost every week, and battalion drills – twice a month. "How often marines practice jointly with infantry, aviation, army artillery, and airborne troops?" was my question to the brigade commander. "As long as now Black Sea Fleet is a part of Southern Military District, basically, you must work together". "Such exercises are planned by higher headquarters", answered Col. Belyavsky. "The next one is coming in October. That's right, with airborne troopers, one of our marine battalions, aviation, ships and other assets. But the exercise will take place not in Crimea but in Russia". "At this range we hold only platoon and company drills", says Col. Belyavsky. "To conduct battalion and brigade exercise, there is another range near Feodosiya at the Apuk Cape. We can carry out combat firings by all kinds of guns, attack aviation, and ship-based artillery. And by the way, comparing to recent years when there was shortage of fuel and materiel, now we perform such exercises quite frequently. Normally, at least twice a year. True, as we noticed, marines are equipped with quite obsolete hardware, although still functioning properly. So far, it is very hard to find adequate substitution. Even though BSF Deputy Commander Rear Admiral Troyan told us he was ready "to disappoint skeptics, since Russian shipbuilding program provides reinforcement of Black Sea Fleet with new ships", de facto there is another situation. Many BSF ships are decommissioned (for instance, large ASW ships Ochakov and Kerch, diesel electric submarine B-380 Svyatoi Knyaz Georgy, hospital ship Yenisei, sea-going transport ship Turgai, cable layer Setun, and sea-going armament support ship General Ryabikov), but there is no shift for them so far. Not only because new ships are either non-completed or have not passed trials. The matter is that Kiev still has not given consent to reinforce Black Sea Fleet. Neither has it let Russia re-equip naval aviation, air defense and marine units. Although intergovernmental treaty dealing with the Black Sea Fleet deployment in Ukraine does stipulate such reinforcement, Russian defense minister Anatoly Serdiukov once said that "we seem to interpret this agreement differently". Judging by aggravation between Moscow and Kiev over gas price, marines of 810th brigade would have a long way to receive new combat equipment. But problems of Black Sea Fleet do not end with simple hardware renewal. LtCol Sergei Lovkachev, logistic support battalion commander of 810th Marine Brigade told me that JSC Oboronservice which is actively intruding in army maintenance system has not reached Black Sea Fleet so far. No one knows what the word 'outsourcing' means. Considering that funds for repair and maintenance are not coming either, it looks like it should be done via notorious Oboronservice. Vicious circle. "What a tricky question – how one can build mean line of fire without any materials", wonders the officer. "Ukraine does not allow equipment deliveries from Russia. Any cargo for Black Sea Fleet passing Ukrainian border is imposed by customs duty which sometimes higher than cargo value. So, we have to buy everything from local Ukrainian firms, and then either Black Sea Fleet HQ or Moscow pays them. However, we can't find everything we need around here, so our motto – keep what you've got. Actually, there's no one to rely on". Interstate relations are sensitive and complicated affairs always infringing interests of ordinary people. For instance, Ukrainian mail service regularly returns sailors' letters sent free-of-charge to Russia in special military envelopes. Nobody explains why it happens and what the problem is. We faced unpredictability of relations between Black Sea Fleet and Ukrainian authorities being on board air-cushion missile ship Samum. The ship's commanding officer Capt 2 rank Dmitry Dyskin told us about coming gun firing drills of 76-mm AK-176 and 30-mm AK-630, and ship-to-air missile launches of Osa-MA2 SAM system. To hold such drills, Su-24 bombers were supposed to fly over the ship in appointed time. However, the aircrafts failed to do that. Local Ukrainian authorities refused to clear them for takeoff. So, the crew of Samum had nothing to do but to cancel antiaircraft drills. Nonetheless, artillery got top marks. All targets were hit. Since it is strictly prohibited to stay on the deck during combat firing, we watched it from commander's bridge. Chattering like a sewing machine, "metalcutter" (a facetious name of 6-barrel 30-mm gun firing 6,000 rounds per minute) released jets of flame, and between them were heard hull-shaking sounds of 76-mm bow gun. Unfortunately, the tactical exercise program did not include launches of Moskits, supersonic antiship missiles 3M80 (Americans dubbed them "Sun Burn"). People say it is incredible scene. Almost invisible for opponent's radars, Moskit missile is snaking at 4-6 meters over the surface in the mist cloud. Having approached a ship, the missile circuits it around and then getting high like a cobra hits the bulkhead from above and explodes inside the hull. Titanium warhead pierces any metal, even armor, and after explosion it is impossible to extinguish the fire. Titanium fires at over 1,000 Celsius degrees, and there are no means to damp it. …We were returning to Sevastopol after tactical exercise at 25 knots which is relatively low speed for Samum. The 3-4 grade wind came on, and waves were splashing against the ship's luff. They noisily flew up to the bridge for a moment covering sea, skies, and forecastle with 76-mm gun and "metalcutter" with white foam, and then fell down with roar dampening even sound of diesels. Samum was sailing smoothly, and hopped on each wave ridge. It must have been incredible sight – a menacing warship flying on the waves like a fast-speed glider. "If Black Sea Fleet operates not only two ships like Bora and Samum but five, we'd definitely run this region", said executive officer of 41st Missile Brigade Capt 2 rank Dmitry Kuzmenko.